^ Krieg, Gregory (9 May 2017). "Who is James Comey: 7 things to know about the fired FBI director". CNN. Retrieved 8 July 2017. ^ a b Prokop, Andrew (14 June 2018). "The long-awaited inspector general report on the FBI, Comey, Clinton, and 2016, explained". Vox. Retrieved 18 February 2019. 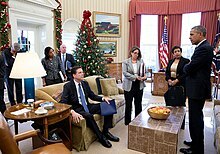 ^ "Feds tighten noose on Martha". CNN Money. February 6, 2003. 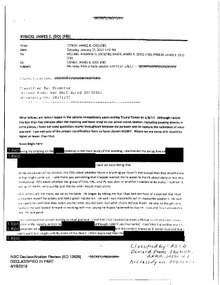 Retrieved 20 February 2019. ^ Farrell, Greg (March 4, 2003). "Waksal pleads guilty to avoiding sales taxes on art". USA Today. Retrieved 20 February 2019. ^ "Quattrone charged". CNN Money. April 23, 2003. Retrieved 20 February 2019. ^ "FBI arrests 40 in foreign exchange trading 'scams'". CBC. November 13, 2003. Retrieved 20 February 2019. ^ a b Perez, Evan (July 7, 2013). "Nominee for FBI Top Post Likely to Face Tough Questions". The Wall Street Journal. Retrieved February 12, 2017. (Subscription required (help)). 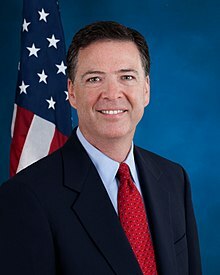 Mr. Comey, during his tenure as deputy attorney general, endorsed a legal memo that authorized the use of waterboarding, which induces the sensation of drowning, on detainees held by the CIA. ^ Greenwood, Max (July 26, 2017). "House Judiciary Committee votes to request documents on Comey, Clinton". The Hill. Retrieved 28 July 2017. ^ Shugerman, Emily (2017-06-08). "James Comey: Trump did not ask me to drop investigation into Russian election meddling". The Independent. Retrieved 2017-07-26. ^ Lee, Carol E. (January 29, 2018). "Trump's gripes against McCabe included wife's politics, Comey's ride home". NBC News. Retrieved 19 March 2018. ^ Fabian, Jordan (May 11, 2017). "Huckabee Sanders stands by claim FBI 'rank and file' lost faith in Comey". The Hill. Retrieved 19 March 2018. ^ Rucker, Philip; Parker,, Ashley; Barrett, Devlin; Costa, Robert. "Inside Trump's anger and impatience – and his sudden decision to fire Comey". The Washington Post. ^ Naylor, Brian (June 8, 2017). "'Lordy, I Hope There Are Tapes': Highlights Of James Comey's Testimony". NPR. Retrieved 19 March 2018. ^ "Trump says he has no Comey tapes". POLITICO. Retrieved 2018-11-06. ^ Comey, James (2017-06-08). 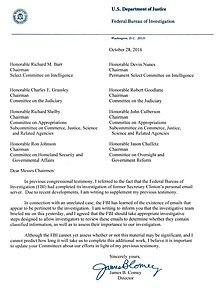 "Statement for the Record Senate Select Committee on Intelligence" (PDF). United States Senate Select Committee on Intelligence. pp. 2, 4, 6. Retrieved 2017-07-19. I discussed with the FBI's leadership team whether I should be prepared to assure President-Elect Trump that we were not investigating him personally. ... without him directly asking the question, I offered that assurance. ... I replied that he should give that careful thought because it might create a narrative that we were investigating him personally, which we weren't ... we had told those Congressional leaders that we were not personally investigating President Trump. I reminded him I had previously told him that. ^ Carroll, Lauren; Kruzel, John (2017-06-07). "The 3 things Comey's advance testimony corroborates from press reports, Trump". PolitiFact. Retrieved 2017-07-19. 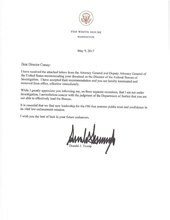 Comey's prepared remarks bolster Trump's claim. He says he assured Trump three different times, the first instance coming in a January 6 meeting a Trump Tower. ^ Stracqualursi, Veronica (2017-11-02). "Former FBI Director Comey takes veiled swipe at Trump with book: 'A Higher Loyalty'". ABC News. Retrieved 2017-11-02. ^ Allen, Mike; Gerstein, Josh (2013-05-29). "President Obama to tap James Comey for FBI". Politico. Retrieved 2017-06-14. ^ Green, Frank. "Comey's new book includes personal passages about his time in Richmond, death of his newborn son". Richmond Times-Dispatch. Retrieved 19 April 2018.